This pretend play elf workshop is a part of the Big and Little Pretend Play series. 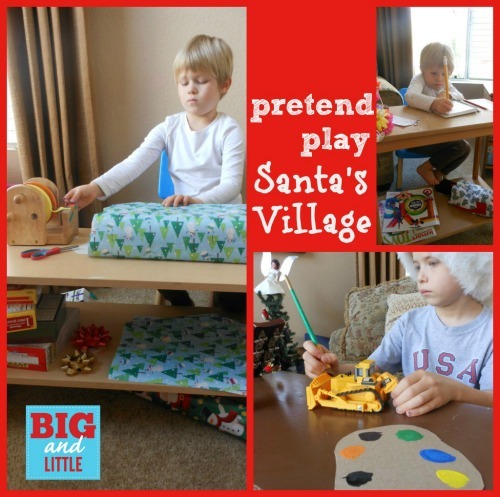 Make sure to check out all of the pretend play ideas (we had some really fun ones!) When the kids were younger I used to spend hours setting up fun areas with special details, now M and M have taken over the planning. 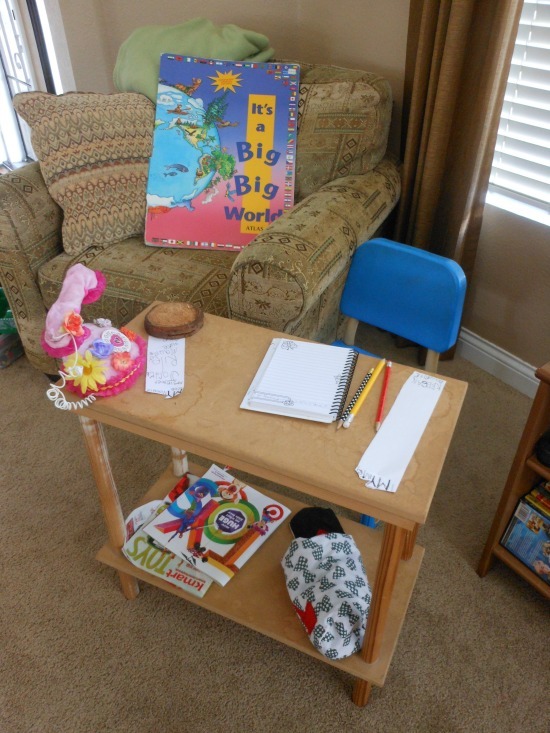 While pretend play at our house has NOT slowed down… my involvement isn’t what it used to be. Their pretend play props pop up while their playing, and creating the space themselves has become part of the fun. So I had to step back a little. Posts like this one (first published in 2012) are a great way for me to look back and see how much the kids have grown. After you check out our workshop, head on over to At Home with Ali to see her LITTLE Santa’s Village! It looks so yummy. M, M and I sat down together to discuss our vision of Santa’s Village. 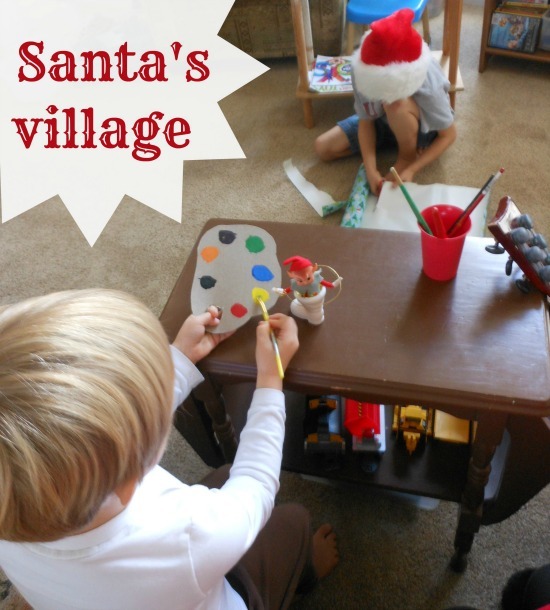 We decided that Santa’s village would have 3 main work areas. The planning area is the perfect place to check the naughty and nice list, pick up new letters to Santa, and check the map for each gifts destination. Little M loves notebooks and has spent quite a bit of time writing out a plan for all the elf’s (I wonder where she gets it, hee hee). She made the nice and naughty list all on her own. Hmmm… where is Mom on that nice list? The Toy Making Area is where all the painting happens. If we had pretend play tools I would have added them here to… but all of the kids tools are real (and in the garage). 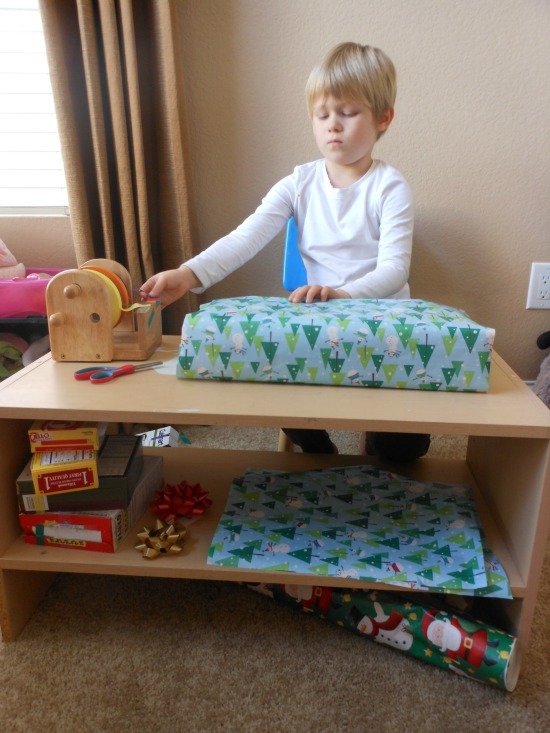 What would a Santa’s Village be without a wrapping station? So of course we needed one of those. Tips 1.You can find wrapping paper at thrift stores, garage sales and dollar stores. 2. Cut different size pieces that will fit the boxes you have if you don’t want to give the kids an entire roll. The workshop has been up for less than 24 hours and they’ve already wrapped just about every toy they own. Great practice for when it’s time to wrap the real presents!!! Pretend play isn’t the only place we celebrate Christmas! You might also like candy cane science or Christmas tree sight words. The Elf Workshop originally appeared on December 5, 2012. I love, love, love this. Your kids must have had a ball. I just have to ask, where did you get your tape dispenser? It looks like a good one. Loving this! How great to be Santa’s helper for a day and see what hard work it is to prepare for Christmas 😉 My daughter is one of my main wrappers during the holidays — she learned at a young age. And the writing lists area is great! Can you tell by their very serious faces just how hard the work is? They were cracking me up. Ha ha! We have been doing the same thing today… so much fun isn’t it! What a good idea to get them to wrap gifts! Gotta remember to get my little guy involved in gift wrapping this year. 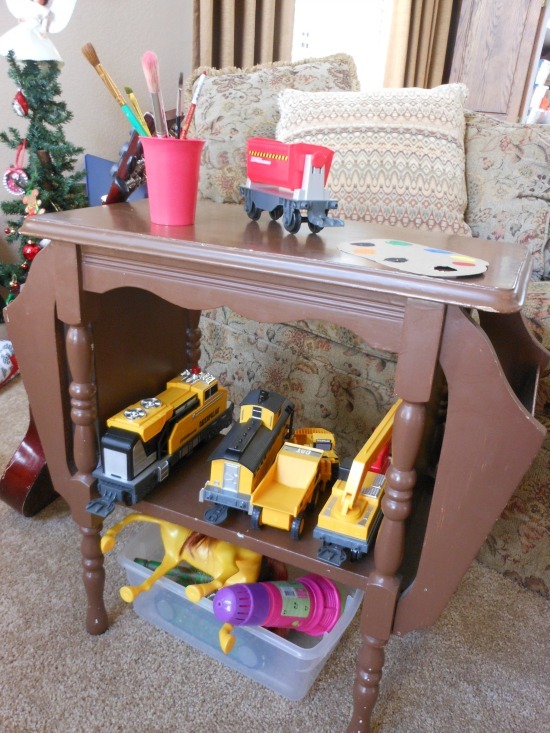 And I love the idea of setting up a station for them for pretend play. So cute! Where did you get that awesome tape dispenser?